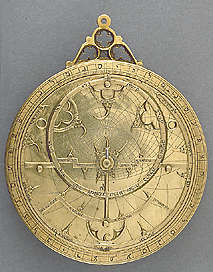 Epact: Astrolabe unsigned, mid 14th century ? This exquisite small astrolabe with quatrefoil decoration is one of the very few instruments of European origin recorded with markings in Hebrew. The instrument bears close resemblances to two astrolabes kept in Chicago and Paris. It is neither signed nor dated, but the style and the month names used suggest it might have been made in 14th century Spain.